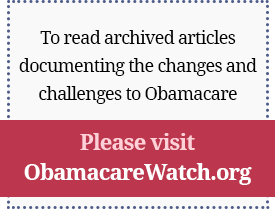 Decisions by health care authorities are impeding patients’ access to new medicines. That is a headline Americans expect to read about barriers to treatments in government-run health care systems that ration access to care, often to stay within their global spending budgets. But a study presented at the recent American College of Cardiology annual meeting in Washington, D.C., showed this increasingly is happening here in the United States. Whether patients are required to “fail first” on generic drugs before newer and better drugs can be prescribed or because of convoluted prior authorization requirements, patients are being denied treatments their doctors believe would be best for them. These issues were the topic of a forum on physician autonomy in Washington hosted by the Galen Institute—founded 20 years ago to promote policies that protect the doctor-patient relationship and foster an informed conversation over patient-centered health reform. Physicians, patient advocacy group representatives and policy experts met to discuss the challenges and potential solutions to this growing problem. These policies also burden physician practices by diverting time away from patient care. Seventy-five percent of practicing physicians reported that prior authorizations are a high burden for them and their staffs, according to a December 2016 AMA survey. Twenty-two percent of physicians said they and their staff spent 20 hours per week processing prior authorization requirements. One North Carolina health insurance plan requires physicians to pay $250 to file a second appeal of an adverse insurer decision. Dr. Seth Baum, the keynote speaker at the Galen forum, said that it is vital that patients become aware of the obstacles their physicians face in prescribing the best innovative treatments for them. He is the president of the American College of Preventive Cardiology. He pointed to “fail first” policies, which require doctors to prescribe older, cheaper medicines for patients until those patients fail on those drugs before they can prescribe breakthrough treatments that, in the physician’s expert opinion, would be more effective. The day after the Galen forum, Dr. Baum presented at the American College of Cardiology meeting the results of a study on access on which he was lead investigator. It evaluated nearly 50,000 patients who had been prescribed a medicine to treat a genetic disorder that causes their bodies to produce excess amounts of cholesterol. The results showed that nearly four out of five patients were initially denied access to the drug—aPCSK9 inhibitor—by their health plans, both commercial plans and Medicare. And despite often-heroic attempts by their doctors, fewer than half of the prescriptions were ultimately approved. The PCSK9 inhibitor drug Dr. Baum described is Amgen’s Repatha. Results released at the cardiology conference showed the cholesterol drug dramatically outperforms statins. Patients treated with Repatha were 27% less likely to have a heart attack and 21% less likely to have a stroke over two years than if they had been taking statins alone. 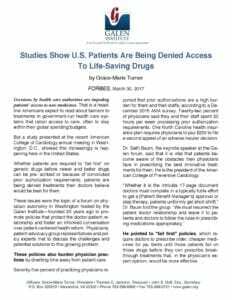 Yet Dr. Baum’s study found that the majority of prescription claims for the drug were initially rejected. The FH Foundation, a group of patients with the genetic disorder called “familial hypercholesterolemia” or FH, said the studies showed that patients whose prescriptions were approved by payers and those whose were denied showed no major differences across a number of patient characteristics. “The similarities in clinical profiles between accepted and rejected patients suggest concerning inconsistencies in the approval-rejection process,” according to Katherine Wilemon, founder of the FH Foundation. The American Medical Association, in conjunction with a number of other medical associations, has developed 21 principles to guide health plans, benefit managers and other conducting utilization management in making decisions about medical and pharmacy benefits. Dr. English says that appeals to payers are most effective when patients or their advocates are involved. Others at the Galen forum said they are working with alternative care models that avoid third-party insurers in providing routine care, with medical students to educate them about the challenges they will face, and in working with the states to advance policy changes that would empower patients. While the third-party payment system is deeply entrenched in American medicine, a larger conversation about the value of new drugs and the longer-term savings they represent clearly is needed.